But if I think I felt this deep down, I would have felt more at ease with the movie. I think the movie savours too much how every time Caesar waits through a tumult of discord or uncertainty to finally speak... or even quietly move a eyebrow, how everyone suddenly stops what they're doing and stands riveted to attend his great wisdom. 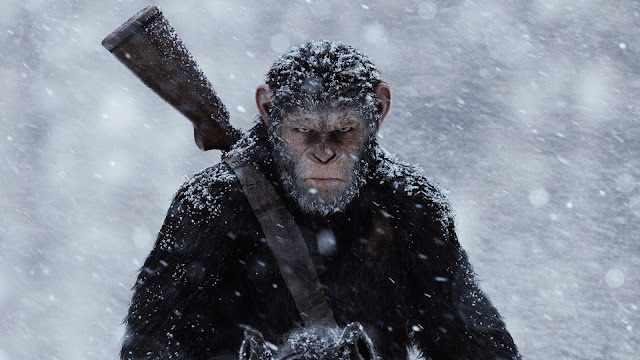 I think the movie savours too much how being amongst Caesar's closest advisors, puts you a bit ahead of all the rest (more than a bit, actually) -- we notice how all three of his advisors, seem especially gargantuan: the chimp is big enough to make his taking on an opponent gorilla, not absolutely ridiculous. I think the movie has us relish too much, how if you find yourself in his doghouse... and thereby end up being feminized in working the kitchen and doing dishes for men who have no respect for you, it's little more than you deserve -- it's appropriate that our last image of you is your being exposed haplessly, from behind. I think that the movie encourages some part of us, not so much to actually notice and remember Caesar's errors in judgment -- of which there appear to be at least two gross ones -- but to be quick to elide them. Anybody else get a feeling that this wasn't only a movie about "people" with sympathy vs. those mostly without any, but about two versions of braggarts who could put us in mind to crush the weak and feel great for being near to the strong, one put forth flatteringly, the other, not so? I would have been a bit uncomfortable with Caesar even if he was never bent on revenge... I mostly overlooked it when I made my analysis. It's not just Caesar, it's how the other apes, as well as the audience, would have reacted to a collection of apes who really contested him... who maybe said, we've enjoyed your rule, Caesar, but your ethos is still too much the brute leader and his body guards defending against endlessly unavoidable enemies, for us not to think we've been saddled with our own General McCarthy. I know you experienced him as a spiritual leader, but I felt him for sure as a war chief. There is no greater macho than the leader... who only ostensibly reluctantly uses force, but whom we never thrill more at when he does... who demonstrates that he, and he only, is Caesar! The villain gorilla ends up redeemed in the end... and by redemption, I mean, he is allowed to go out strong. I felt the film wanted this for him, because it respected his power too -- he doesn't oblige the weak. More this, than just his being long-afflicted for being a "donkey," so not deserving further grievance. Compare him to how Vanilla dies and how he is portrayed. We reject him, Winter, that is, for being genuinely weak -- a turn-coat, not out of deliberation and choice, but out of being fearful and cowardly: plus he let himself get readily tossed aside, emasculated, by the more determined gorilla, when he brought to bear almost the same physical resources -- shame! We'd disassociate ourselves from him, pronto. Even Maurice is overt, intimidating, way-clearing power, not just intellect and wisdom. It would have felt wrong if he was one of the smaller orangutangs... which should be bizarre, given the dimensions -- sympathy, wisdom -- allotted him.